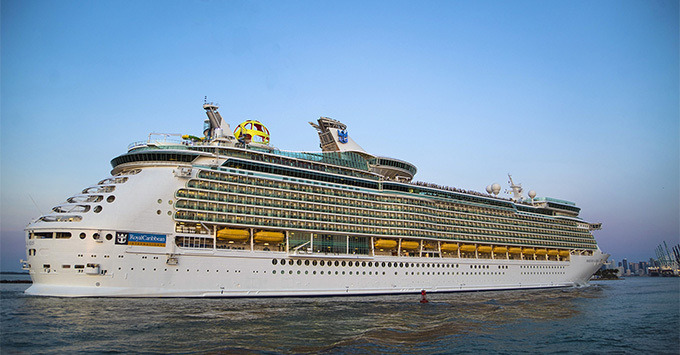 (11 a.m. EDT) -- Fresh off a six-week, $120-million refurbishment in Cadiz, Spain, Royal Caribbean's Mariner of the Seas has returned stateside to begin sailing short itineraries from its Florida home. The ship will sail from Miami on three-night weekend and four-night weekday cruises to the Bahamas. The refurbishment is part of Royal Caribbean's ambitious Royal Amplified program, a $900-million investment from the company designed to inject new life into the cruise line's older ships. Mariner of the Seas, the second ship to go under the knife as part of the program, showcases a number of new features across dining, bars and lounges, and activities. We joined Royal Caribbean to preview Mariner of the Seas on a sailing to CocoCay, the line's private island. Our three-night itinerary -- exclusive to employees and a handful of media on this sailing -- will be part of the ship's usual rotation; the four-night option will include a stop at Nassau in addition to CocoCay. While onboard, we tried out everything from Tiki bar-inspired cocktails to the shipboard escape room and an Italian feast from chef Jamie Oliver. Here's what you can expect when you sail on the newly upgraded Mariner of the Seas. The public areas of Mariner of the Seas look stunning. The Royal Promenade has a grand feel thanks to a soaring ceiling, marble floor and accents that match the various venues throughout the space (bright and bold here, a refined cafe look there, stately wood paneling over there); the pool deck is full of bright, welcoming touches from the loungers to the bar chairs to tile accents by the pools; the Solarium (the adults-only pool, hot tub, bar and lounge area) looks chic with its collection of daybeds and loungers, and the mellow tones throughout make the accent colors pop; the Dining Room exudes elegance thanks to a high ceiling, enormous chandelier, and plush, tasteful chairs; and every venue, be it bar, specialty restaurant or shop, has a distinct look and feel. One fellow passenger nailed it, saying "The ship looks like it was built for Instagram," and we couldn't agree more. This concept, from celebrity chef Jamie Oliver, serves fresh pasta made by hand in the kitchen every day. The dishes are rustic and familiar yet steeped in Oliver's personality. A number of dishes on the menu, such as the antipasti plank and crispy squid, are made to share, but others, including the crab and avocado bruschetta, are perfect for one. Entrees like the fresh crab spaghetti and Gennaro's tagliatelle Bolognese were lovely on the plate and delivered on flavor in a way you only find with fresh pasta. Salads, desserts and cocktails were on par with the rest of the meal, and the wine list seemed a perfect match with the menu. The restaurant was welcoming, with plenty of wood accents and big windows making for a perfect sunset view. 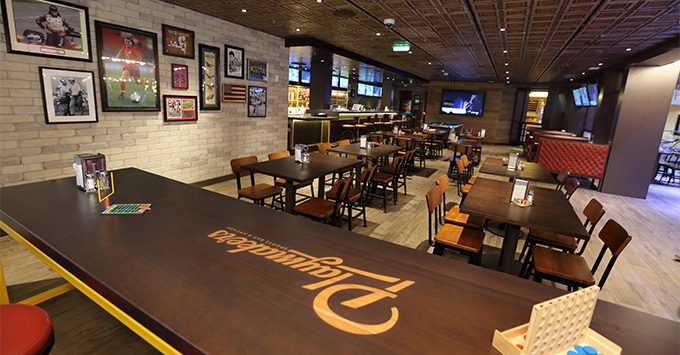 Jamie's Italian is a fixture on many of Royal Caribbean's newer ships and a welcome addition to Mariner. Serving up a good variety of beer and cocktails and a menu packed with pub-grub (think chicken wings and burgers), Playmakers was a favorite for many of our fellow passengers. With World Cup matches and highlights on each one of the 30-plus TV screens, it delivered exactly what the patrons wanted: cold beer, something to munch on and their favorite team on TV. Throw in an indoor version of outdoor games like oversized Connect Four and a positively monstrous Jenga set, and it's easy to see how popular this venue will be with sports fans sailing in any season. Remember the spatula-flipping, shrimp-tossing, play-the-cooktop-like-a-drum-set fun of dining in a hibachi restaurant shoreside? Well now you can get that here. Izumi was packed on our sailing -- so packed we couldn't get a reservation (and it's reservation-only) but we were able to peek in during dinner service, and the diners we spoke with absolutely raved about it. Everything from the tableside show to the freshness and creativity of the sushi offerings got two thumbs up from our fellow passengers. This Polynesian bar has a kitschy, infectious retro vibe and a look to match. Gorgeous jungle prints, bamboo and wood accents, and bartenders wearing fun Aloha shirts were enough to draw many a thirsty passenger in, and the playful Tiki-bar inspired cocktails kept them glued to their seats. You can't miss the Sky Pad. 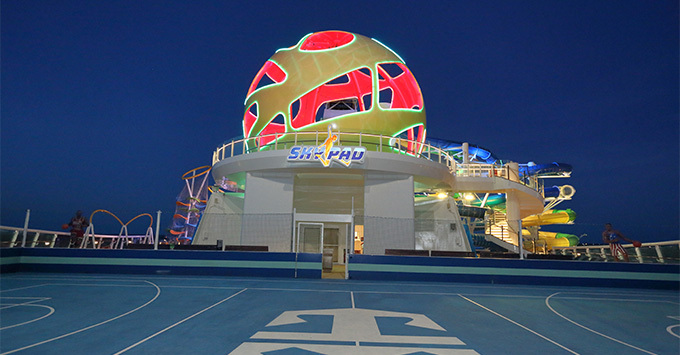 In fact, as I arrived to the port, I pointed to the Sky Pad -- a giant yellow-green orb perched on the top deck -- and told my Uber driver, "That ship." Passengers line up to get into the Sky Pad, where they'll climb onto a small trampoline, strap into a bungee harness and put on a virtual reality headset. Then, jumping and screaming in delight (to be fair, it did seem the VR experience drove more than a couple of passengers to screech in good-natured fear), passengers took part in one of three virtual reality experiences that ranged from a Candy Crush-style game to a futuristic battle with aliens. There was a line, but every person who stood in it came away happy and ready to go again. Plus, it's included in the cost of your cruise. This 40-foot-long surfing simulator uses water jets to give you the feel of riding a 5-foot wave. If you've never surfed or skateboarded (or haven't for a very long time), it looks intimidating, but instructors are there to help you make the most of your experience on the small wakeboards you ride or on the Boogie boards some passengers opt for. Experienced surfers and skaters will have no problem hopping on and sweeping back and forth or even pulling off a few tricks. That said, the number of passengers we saw successfully pull off 180- or 360-degree jumps was far lower than the ones we saw ride the wave for 20 seconds, fall off and come up grinning, ready to go again. Twin three-story waterslides that curl, spin and loop around one another as riders race to the bottom had hundreds of passengers braving a line that was a consistent feature of our sailing. It was worth it, though, in part because the fee-free waterslides (named Cyclone and Typhoon) are awesome, and in part because each features Plexiglas "windows" that let you look out over (and down!) the ship as you race. Royal Caribbean's smart to bring the escape room craze onboard, and its execution on Mariner of the Seas is flawless. (The cruise line has several other escape room options on a number of its newer ships, including Harmony and Symphony of the Seas.) Escape rooms pit clever-minded puzzle fans against the clock as they race to solve a series of challenges that allow them to "escape" the room or, in this case, save Earth, in less than an hour. The Observatorium puts passengers in the situation of racing to find clues that will allow them to recalibrate a telescope and neutralize an impending asteroid strike. The puzzles were hard enough to cause some head scratching, but not so tough that we couldn't figure them out, and our group saved the world with 15 minutes left on the clock. The game room was an amazing set piece and it only took a few moments to become fully immersed in the scenario. A referee stays in the room with you to help if you get really stuck and to ensure everyone -- and everything -- stays safe. You'll pay a nominal fee to try out the Observatorium. In Studio B, teams battle for the supremacy of Planet Z in an extreme -- but fun -- game of laser tag. This included activity drew a big crowd on our sailing, and the action was intense. Two teams fight through a maze of inflatable obstacles, blasting away with their laser guns while music plays and a scoreboard keeps everyone abreast of the game's progress. 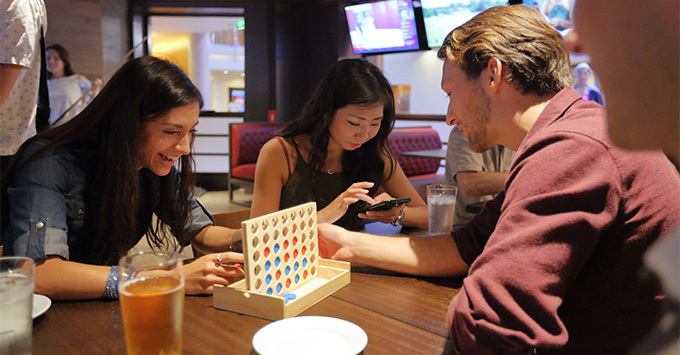 Great for large groups who want to play together or go head-to-head, and for small groups like families, couples or even solo travelers, it was easy to find an open spot in one of the evening's games. It was an interesting way to get to know you fellow passengers. Studio B was set up for Planet Z on the first night of our sailing. On the second night, it was converted into an ice rink for the Ice Under the Big Top show, then into a nightclub for a little late-night dancing. It's a clever way to make use of this space to ensure it served passengers of all ages and interests. There's no additional charge for Planet Z or any of the activities in Studio B. For many of us, internet access -- especially for social media -- is critical on any ship, and Royal Caribbean's Voom Wi-Fi delivered easy-to-connect, affordable internet access. As advertised, it was fast, and coverage was quite good. Except for few spots around the ship where we dipped below a full-strength signal, we noticed no real difference when compared with the mobile phone browsing and Instagram posting we do at home. Twice we found the coverage slow, but both times we also found ourselves surrounded by hundreds of other connected passengers. Ok, fine, the Stowaway Pianist, a mysterious mobile pianist, isn't a new concept, but it's a delight. Whether you find him set up in an elevator playing Beethoven in ragtime, pounding the keys outside Windjammer Cafe or tickling the ivories while couples strike up an impromptu waltz on the Royal Promenade, the Stowaway Pianist puts a smile on every face.